Operating on A.M. 3885khz, Range 100ft to 1 mile using 5 valves. 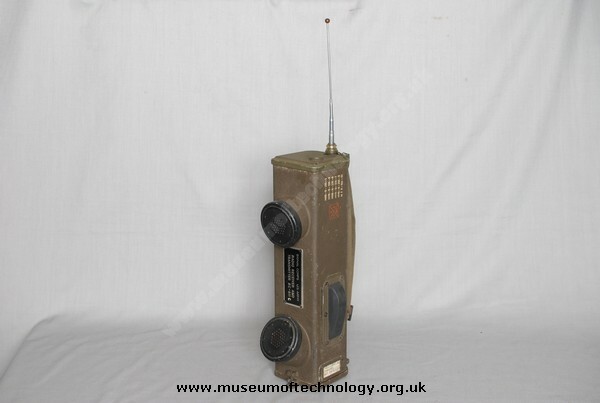 Known as the 'Handy Talkie' This small hand held radio was used for communications at very close range, with a max range of about one mile in ideal conditions. It is often incorrectly named the walkie-talkie. The French army used a post-war produced version almost identical to the WWII model. A special webbing padded case was made for this item. The BC-611 could operate between 3.5 and 8MHz by changing coils and crystals inside. The Japanese produced a similar set but operating on higher frequencies but using the same batteries as the BC-611.